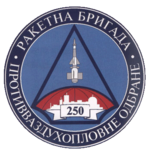 The 250th Air Defense Missile Brigade (Serbian: 250. ракетна бригада ПВО, translit. 250. raketna brigada PVO) is a joint tactical unit of Serbian Air Force and Air Defence. It consists of three rocket missile air defense battalions, three self-propelled rocket missile air defense battalions and a command company. The command of the brigade is based at "Banjica" military barracks, located in Banjica, a suburb of Belgrade. Three "Neva" battalions are deployed around Belgrade, first one at Jakovo, second one at Zuce, and another one at Batajnica Air Base, while three "Kub-M" battalions are deployed near the towns of Niš, Novi Sad and Kragujevac. The Brigade was formed during the existence of Yugoslavia, serving in the militaries of both the Socialist Federal Republic of Yugoslavia and the Federal Republic of Yugoslavia. Following the dissolution of Yugoslavia, it continued to serve in the military of Serbia. During the 1999 NATO bombing of Yugoslavia, the Brigade shot down an F-117 Nighthawk, believed to be the first shootdown of a stealth aircraft, and the only loss of an F-117 in combat. The 250th Air Defense Missile Brigade history goes back to November 25, 1962, when 250th Air Defense Missile Regiment (250. raketni puk PVO, 250. rp PVO) of JRV i PVO was established in Belgrade with the task of defending that city, which was at that time the capital of Communist-controlled Yugoslavia. Between 1962 and 1980, the 250th Air Defense Missile Regiment was armed with S-75 Dvina (NATO designation: SA-2 Guideline) high-level air defense system and its structure was composed of four rocket and one rocket-technical battalions. In 1966 1st and 2nd Missile battalions, rocket-technical battalions and part of regiments command were sent to Soviet Union, rocket-polygon for missile shooting of PVO units "Ashuluk" near Astrakhan. The shooting was done on September 30. This task was successfully accomplished. The 250th Air Defense Missile Regiment international military public represented itself in the best possible way, and in the beginning of October Regiment returned from the USSR. This was the first time that a Yugoslav People's Army unit went abroad for its task execution, so the preparation for shooting is dedicated to the special attention. 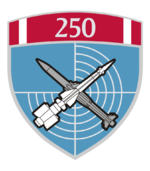 The 250th Air Defense Missile Regiment changed its name to 250th Air Defense Missile Brigade in 1980 as a result of its expansion with four rocket and one rocket-technical battalions of the S-125M Neva-M (SA-3 Goa) medium-level air defense system. The next evolution in the structure of the 250th Air Defense Missile Brigade took place in 1992 when that unit acquired the 350th Air Defense Missile Regiment (350. raketni puk PVO, 350. rp PVO) that regiment being armed with S-125M Neva-M has been pulled off from Slovenia following that country declaration for independence from the rest of Yugoslavia. This change finally initiated the long-waited retirement of the Dvina rocket system from the structure of the 250th Air Defense Missile Brigade. When JNA was officially dissolved in May 1992, the unit joined the newly formed Military of Federal Republic of Yugoslavia as part of Air Defense Corps of FRY Air Force and Air Defense. In period from 1994 to 1996 missile battalion armed with S-75 Dvina air defense system were disband. 5P73 launching ramp and PR-14AM vehicle for transport and placement of missiles of Neva system. P-40 radar (left) and 2P25M transport and launch vehicle (right) of 2K12 Kub system. SNR-125 "Low Blow" Neva system. When Yugoslavia came under NATO attack (named Operation Allied Force) in 1999, the 250th Air Defense Missile Brigade was armed only with the Neva-M medium-level air defense system. The brigade was active during 78 days of NATO attacks 24 hours per day. Its units performed 111 maneuvers, occupied 88 fire positions and relocated its equipment to more than one hundred locations. It was attacked from the air with bomb and missile strikes more than a hundred times. On March 27, the 3rd Battery under command of Colonel Zoltán Dani shot down a stealth F-117 Nighthawk using a modification of the Neva-M system. The Nighthawk, sporting the markings "AF 82 806 HO" crashed in the vicinity of the village of Buđanovci, near Ruma in Srem. It was believed to be the first confirmed shootdown of a stealth technology aircraft. The aircraft was flown by USAF Lt. Colonel Dale Zelko. On May 2, a USAF F-16CJ Fighting Falcon was shot down by the 250th Brigade in area of Novi Sad close to the village of Nakučani, near Šabac. The aircraft was flown by USAF Lt. Colonel David L. Goldfein, commander of the 555th Fighter Squadron and Chief of Staff of the Air Force since July 1, 2016. This shootdown was also the work of the 3rd Battery, though due to the shift schedule, Dani was not present. Major Boško Dotlić oversaw the shootdown. The last significant moment in the history of the 250th Air Defense Missile Brigade took place in October 2004 when Neva-M armed 450th Air Defense Missile Regiment (450. raketni puk PVO, 450. rp PVO) ceased to exist after it was previously transferred from the town of Kraljevo (where it was deployed for 12 years after being pulled out of Macedonia in 1992) in the Belgrade area where it was integrated into the structure of the 250th Air Defense Missile Brigade. The recent integration of all Serbian Army Kub-M systems within the 250th Air Defense Missile Brigade marked the end of the existence of three other Serbian air defense units: the 230th Self-Propelled Air Defense Missile Regiment (230. samohodni raketni puk protivvazduhoplovne odbrane, 230. srp PVO) based in the town of Niš, the 240th Self-Propelled Air Defense Missile Regiment (240. srp PVO) based in the town of Novi Sad and the 310th Self-Propelled Air Defense Missile Regimen (310. srp PVO) based in the town of Kragujevac. Previously, in 2004, Serbian-Montenegrin Armed Forces disbanded another Kub-M unit - the 60th Self-Propelled Air Defense Missile Regiment (60. srp PVO) based in the town of Danilovgrad and responsible for the defense of Montenegrin capital Podgorica. The main equipment of a brigade consists of Soviet-made surface-to-air missile systems S-125M1T "Neva" and 2K12 "Kub-M" and supporting equipment, as surveillance and surveillance-acquisition radars P-12 and P-18 for "Neva", reconnaissance-radar station P-40 with reconnaissance-aviation radar 1RL-128D-1 and PRV-16B altitude assessment radar for "Kub". In addition the units are armed with 9K32 "Strela-2" man-portable, shoulder-fired, low-altitude surface-to-air missile systems (MANPAD). The Neva systems have been modernized to S-125M1T standard with an upgraded digital radar receiver DP/P-12 which enables operation from a location 500m away from the radar cabin. Zoltán Dani, and former commander of the 3rd battery of the 250th Missile Brigade which shot down an F-117 and F-16. ^ "250. РАКЕТНА БРИГАДА ПВО - Јунаци остају јунаци, Одбрана број 4 - 250th air defense missile brigade Heroes remain heroes, Odbrana magazine no.4" (PDF). Archived from the original (PDF) on 2009-12-29. Retrieved 2009-04-01.